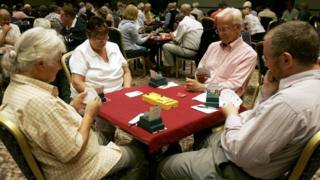 The game of bridge cannot be considered a sport, the European Court of Justice has ruled. The English Bridge Union (EBU) began legal action after Sport England refused to recognise the card game, denying it access to lottery funding. Recognition of bridge as a sport would have exempted the EBU from paying VAT on entry fees to tournaments. It called the ruling "surprising and disappointing " and said it will affect how widely bridge is played in the UK. EU law requires proof of benefits to physical or mental well-being for a sport to claim VAT exemption. Earlier this year the top adviser to the European Court of Justice had backed the appeal. Advocate General Yves Bot said the card game was a sport because it required mental effort as part of a challenge. Image caption Bridge involves predicting the number of tricks each side will win. At a High Court hearing in 2015, the Aylesbury-based EBU unsuccessfully challenged Sport England over its refusal to recognise bridge. EBU lawyers told the High Court the game was based on rules, fairness and competition like other sports and was available to older people, to whom it brought a sense of inclusion and community. But the judge said Sport England's current policy defined sport as involving "physical activity" and its move to reject reclassification of bridge was correct. So-called duplicate bridge, a form of contract bridge, is already considered a sport by the tax authorities of Austria, Denmark, France, the Netherlands and Belgium, but not by Ireland and Sweden. It was classified as a sport by the International Olympic Committee in 1998.